Joe vividly remembers last year at Super Bowl Week when manbeast defensive tackle Aaron Donald of the Rams appeared on “Pro Football Talk Live,” seen on the NBC Sports Network, and said he watches tape of Bucs stud defensive tackle Gerald McCoy to learn how to become a better player. Monday night at Super Bowl Opening Night at the State Farm Arena in downtown Atlanta, Joe asked Donald if he still watches tape of GMC. Oh yes, Donald replied, and more. Whoa. Not only does Donald study GMC’s tape, the two are tight and bounce ideas off each other’s heads to better themselves. This has to leave the GMC haters dumbfounded. The best defensive tackle in the game regularly watches tape and consults with a guy to improve his game, the same guy hundreds (thousands?) of Bucs fans cannot wait to run out of town because… because… because… he doesn’t like Superman? Donald also said he watches old film of Warren Sapp. Because #7423 knows Aaron Donald is actually watching OLD tape of GMC when he was actually good! Gerald McCoy is a big fat softie!!!!!! BF7423 is very brave behind a keyboard. Why not give your opinion to GMC’s teeth? Great get off, can’t finish. That is his problem. That and disappearing for quarters at a time. Yeah he watches tape of Gerald Mc..” oh my gosh Ben did I hit you to hard ? Here take my lunch money” Coy to learn to be a better player. Whatever Gerald does he does the opposite. Nice try Joe of pimping your boy. Not a GMC “hater” by any means…having said that…he’s a polarizing figure for many reasons. He lacks “signature” game saving/ending plays. The Bucs have paid him upwards of 100 million dollars…for that he should have “signature” game saving/ending plays. He has put cringeworthy moments on film…including wearing a dress/smock to training camp on Hard Knocks. He has stated his favorite movie is Little Mermaid and the whole Batman doll/figurine “thing”. He no doubt has fast twitch “get-off”…but lacks brute strength ( as evidenced by his underwhelming 13 bench press reps at Combine…many DTs are closer to 25-30 ) and it shows in many game situations. Aaron Donald is a force…and pretty professional ( got paid and still improving ) . Had Mike Evans not turned out so well, passing on Donald would have been a huge mistake (obviously). At 13 mil…with the salary cap getting tighter…and Bucco Bruce on the loose…it’s time for McCoy to move-along dot com. And I believe he’s a goner. We need to keep GMC the only thing we need to change on the D-line is we need a DE across from JPP. We need to resign Alexander and we can get another OLB in the draft. Sign Tyrann Mathieu to matchup with Evans. Isn’t Fowler the pride of St Petersburg going to be a free agent after the season? He’s very good coming off the edge. The Bucs should go after him. Did he vote for him to be in the top 100 NFL players. Probably not! Don’t worry Donald no one else did either. McCoy should be watching Aaron Donald play and ask himself what happened? Maybe McCoy should have looked into testosterone therapy or something. What will Tmax do for posts after GMC is gone?…….will he go to GMC’s new team’s website and obsess? Clicks will be way down at JBF. As they, those that cannot do, teach. The only thing leaving the “real” fans dumbfounded, is how is he still on the team????? Why was he not traded when a sizable offer was to be had last year????? Why did they build a defense line around him AGAIN, and forced the DC to run a scheme that he did not want to run?????????? Its a shame that they did not go all in to rebuilding the defense last year, They could be so far ahead with a handful of promising talent!!!! instead it is a disaster with old front 7 that is not very good and seems to be injured at inopportune times, and very young secondary!!!!! Great job licht weight!!!!!!!! The 2019 season will reveal answer to the sheep that the “real” fans already know!!!!!!!!!!!!!!!!!!! I don’t see the correlation? What does Aaron Donald status and play have to do with Gerald McCoy performance and salary? Because he watches his film and they talk about technique? Vernon Hargreaves talks and watches Ronde Barber film and that doesn’t translate or make him a better player. I’m not seeing the point. Cmon Joe you should know why by now. 95% of people are followers. They hate gmc because someone else did n it picked up steam. Who gives a flying eff. Theyll find something else to follow once he leaves. I am not a hater. I LOVE GMC, great ball player and an even better person. But as a football fan, I recognize we have a ton of holes. And very few resources to fix these holes. Our options are limited but might include cutting GMC if he does not want to restructure. We CANNOT afford the luxury of paying DT’s 13 million a season for under 8 sacks / 30 tackles a season. And even more to the point. We have been AWFUL on defense nearly his entire tenure with the bucs. We are losing WITH HIM what will it matter if we don’t have him? It can hardly get any worse at this point. Last years defensive failures were nearly historic. We need to get younger and cheaper at the DL position. It might sting but we need to start developing younger cheaper talent across the DL. The only one worth his money is JPP at the moment. 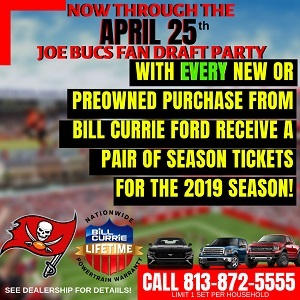 name your sources that claim the bucs were offered picks for GMC…..
your a fraud and your just as incompetent as the staff you praised which got kicked to the curb!!!!!!!! if your not going to be man enough to name your sources, then shut the f#ck up with your lame a$$ conspiracy theories!!!!!!! your coaches failed and it was because of talent!!!! !….it was because dirk and smitty had outdated predictable schemes and were in over their heads!!!!!! GMC is garbage. He was never the player Donald turned out to be. Actually this is an embarrassment When Lovie wanted Donald with the 7th pick GMC said he wasn’t “changing position for no rookie”. Donald became 10 x better than him we would of been NOT the losers we are today if Lovie/Licht pick him anyway….. But of course GMC would of cried about it and not of resigned here. This year was the year he productions on the field was supposed to be better. Obviously it’s the same as usual. There is no excuse for this at all. McCoy studied Sapp. That didn’t work. Aaron Donald studying McCoy doesn’t mean much. Donald have more tackles and sacks in less time than McCoy. That’s because Donald is more talented and more driven to be great. McCoy will never be apart of a defensive POY conversation. Why pay him him Donald money for Will Gholston production? It makes no sense. Maybe Donald is McCoy secret agent. I’m not saying McCoy is a bad player but IMO he does not deserve 13mil at his age. Especially since we need the salary cap space. Half of the McCoy haters don’t know football. No one used GMC properly since Gregg Schiano in a one gap scheme. Mike Smith wanted GMC to take up space and let the LB’s eat. I hope McCoy stays in Tampa (not at current salary tho) cause I know we are going to playoffs next season and I would hate to see him thrive somewhere else like Talib and others. 2 years ago….. “Im a 3 tech and 3 tech only”. Last month. ” I don’t care 4-3, 3-4, 46 whatever. I can play it all”. Gtfoh GMC does not even keep it real. So the best you can do to defend GMC is an article talking about someone else watching GMC? LMAO. Over rated and over paid. Hopefully that gets fixed with a competent coach. I notice everyone only refers to his first step and basically nothing else in terms of what he brings. McCoy’s return on investment needs some discussion. GMC played in 123 of the 144 games during his 9 years with the Bucs. He’s averaged 2.40 tackles and .44 sacks a game. He’s paid $110,113,000 for his effort. His 295 career tackles averages out to $373,264 paid per tackle. JPP has played 127 out of 144 games. He’s averaged 3.88 tackles and .60 sacks per game. His ROI is $140,349 per tackle. That’s $232,657 a tackle less than GMC. I don’t think you can blame GMC…I blame the Bucs for throwing money away for his ROI. This has to be deflating to his teammates. The only one winning is GMC. It would be addition by subtraction by cutting GMC. No restructure…unless he’s willing to play for free. Other defensive front name players earn much less. SUH earns $81,233 less than GMC per tackle. Donald earns $178,249 per tackle less than McCoy. Cox earns $196,160 less than GMC. Didn’t our Bucs pass on Aaron Donald? Yes that why the haters are out in force , he relies on his get off and that’s about it !!! The Guy is such an attention seeker he has for years clearly tried to look good on tape w penetration while not even trying to make a play on the BALL !!! No Doubt in my mind , I’ve seen it time and time again !!! At some point early in the Lovie debacle they were both praising each other and GMC was told you just need to dirupt and Man was that the wrong thing to tell an attention seeker !!! The Ball , What Balll!!! I’mm a disrupter, never mind I’m 8 feet from the ball, three yards outside my gap , 5 yards behind the line of scrimmage, no where near the play !!! Trust me folks there are reasons GMC looks great on tape with get off and penetration but never never never is a factor in a game !!! Would an NFL player getting paid 13 mil purposely work slightly away from a play to look great on tape ??? Well McCoy has a better get off tha Donald who is a factor in almost every game but some how McCoy simply has almost never been a factor in any game his entire career !!! How ??? How is this possible !!! I think the haters KNOW !!! Ask the audience they are seldom wrong !!!! So Yes Donald watches part of GMC s game but then Donald makes plays , you won’t find him shooting gaps to look good !!! It takes talent to be the best dang DT in the league, not watching film. He’s ONLY watching GMC’s tape to figure out how to get a fast get off, not how to be a DT by GMC’s standard. GMC was good, but there’s no nasty in him and his best days are behind. Everyone knows Aaron Donald is comin and they still can’t stop him. GMC was never as dominant as Donald. That’s the point. Talking shop and tech with GMC is only going to improve Aaron Donald’s game by a fraction. That man is ballin all on his own. Not a hater but real is real and he aint worth 13 million anymore, same as djax aint worth keeping period. McCoy’s production is now in the six to eight million dollar range.Great person—but he will not accept this sum and it isn’t wise to offer him more. He watches his “get off”. Big deal. That’s like saying Tiger Woods watches some other golfer’s bunker work. It’s ONE aspect of his overall game. ONE. Obviously Donald doesn’t know as much about football as half the posters on here. Wow, why aren’t you guys in the League if you are so smart? But no, others know better then the DMVP. It’s very simple Joe, 17 tackles is not worth 13 million dollars. @ old school …….. then there would be no coaches or the coaches would replace players ……… I give , old school !!! which one is it ?? He’s got one move then nothing else. Donald can study that get-off all he wants, but it’s what he does after it that distinguishes him. 20 sacks this year.. Let’s please not allude that these two players are at all in the same ‘league’.